Contractor, Italian Condotte S.p.A has achieved breakthrough using a Cat double shield hard rock TBM on the 5.8km long Service and Safety Tunnel running parallel to the existing Great St. Bernard Tunnel. The new bore was built to improve safety, efficiency and ventilation of the Great t Bernard Tunnel with the two being linked by 23 cross passages every 240m. The transalpine tunnel alignment passes through main rock formations such as gneiss, schist and sandstone, UCS between 40~140MPa, with cover up to 950m. The tunnel is lined by 4-piece trapezoidal precast concrete segments. TBM launch was inaugurated on October 4, 2010 and achieved its best month of 493 rings (approximately 640m) and best day of 35.2m both in March 2012. 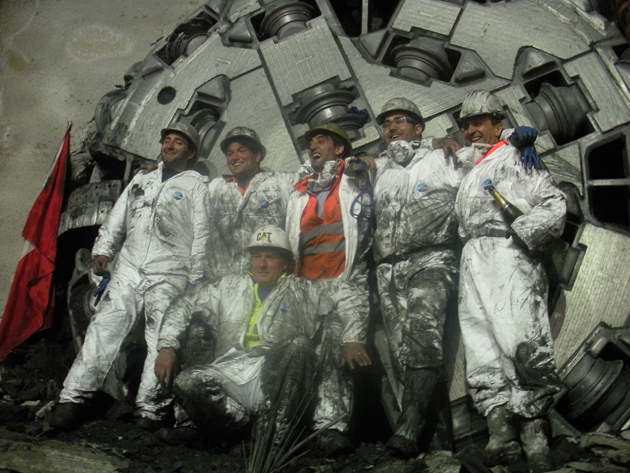 The TBM maintained an average operating advance rate of 18m per day. From the original opening in 1964 until year end 2011 the Great St Bernard Tunnel has provided a link between Switzerland and Italy for nearly 26 million vehicles. The successful breakthrough of the new service and safety tunnel will help take the safe operation of this Main Tunnel to the next level for both personal and commercial transit.